I was working with a client of mine the other day, one that I had worked with numerous times before and I noticed something amazing. Her skin was glowing, scar free (she had a few before), and super tight! I asked her to spill her secret! What was she using? The DermaRoller, and said she loved it! She was using it for scars, to renew her skin, remove wrinkles, and lessen her stretch marks. This sounded a little too good to be true. Could one little simple tool, really be this beautifying? I had to try it myself! To my surprise, after the first few times of using it, my skin became super soft, and my wrinkles lessened tremendously! I HIGHLY recommend this!! For stretch marks, scars, hair loss, to tighten skin, etc! I recommend buying the one with the smallest size needles. The discomfort is low with that one. If you have had any cosmetic procedures, I recommend consulting with your doctor first just to avoid any complications. Make sure you use it correctly and remember hygiene! After all, you could cause an infection with those tiny little pricks! 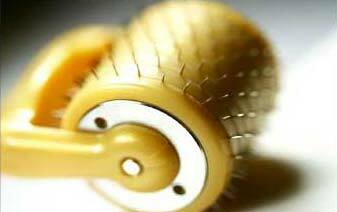 Hi can you please give me the website for ordering the scientia derma roller? Thank you so much! You mentioned “hair loss”….how? like literally run it through my scalp?? Huda, can it be used on lips as well? Hey huda big question when you say scars do you just mean dark marks or little indents too? Just bought it!! I hope it works for me. hi, what do u think about using dermaroller on tattoo scars (for reducing)??? Guys click on the DermaRoller word and it will take you to the site where she bought the dermaroller from. Can you tell me which size I should start with on a derma roller? I can’t wait to purchase one! Thanks! Thanks for sharing this secret, do u know if it is available in the middle east? will u please help me find this product. I reside in dubai.